AMERICAN expatriates in bohemian Paris when the 20th century was young, the Steins – writer Gertrude, her brothers Leo and Michael, and Michael’s wife, Sarah – were among the first to recognise the talents of avant-garde painters like Henri Matisse and Pablo Picasso. Through their friendship and patronage, they helped spark an artistic revolution. The San Francisco Museum of Modern Art exhibition has drawn on collections from around the world to reunite the Steins’ unparalleled collections of modern art, bringing together, for the first time in a generation, some 60 works by Matisse, 40 by Picasso and another 100 by Bonnard, Cézanne, Gris, Picabia and Renoir, all once owned by various Steins. The show tells the story of a group of intellectual, eccentric and compelling siblings who put Picasso and other modern artists in the public eye. It was through the Steins that Picasso and Matisse met one another and Picasso saw African art in Matisse’s studio. Picasso immediately began to incorporate some of the stylisation of African art into his own painting with legendary results. The Stein siblings lived on a modest inheritance generated by San Franciso real estate holdings (managed by Michael, the eldest) but were never wealthy. Leo moved to Paris in 1902 and was joined in his apartment at 27 rue de Fleurus by his younger sister, Gertrude, the following year. Leo had ambitions as a painter and pooled his and Gertrude’s money to buy works by such artists as Cézanne to inspire his own practice. Michael and Sarah came to Paris a year later, moved to an apartment on the nearby rue Madame, and also immersed themselves in art. 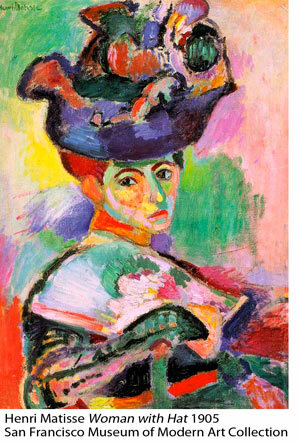 According to Matisse’s biographer, Hilary Spurling, Matisse said long afterward that actually his wife had been wearing black, as all respectable married ladies did in those days, and her hat was black, too. But he had seen it in brilliant colours, and that’s how he painted it. 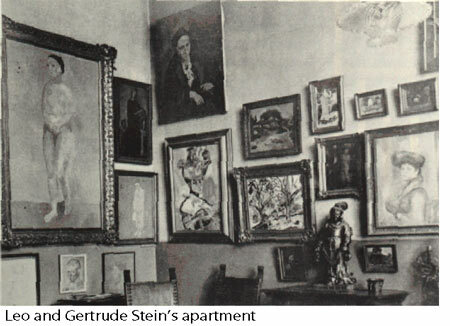 Both Stein apartments held salons on Saturday nights open to anyone interested, with Sarah and Michael becoming the champions of Matisse while Gertrude aligned herself with Picasso (who famously painted her mask-like portrait in 1906). The Steins helped build the modern artists’ markets by encouraging their friends to collect. Leo and Gertrude’s artistic collaboration ended after Alice B Toklas moved into their apartment with Gertrude in 1910. He split their collection, taking the Renoirs, and left in a huff in 1913, never to speak to Gertrude again. 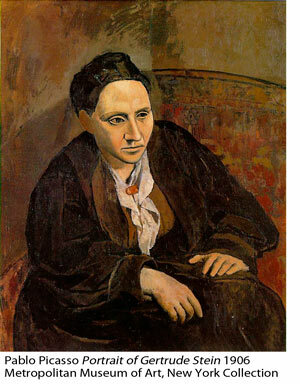 The two women continued to live in Paris until Stein’s death in 1946. Their home was the leading salon for artists and writers between the Wars. Given such a gift for self-promotion, it is perhaps little wonder that, hitherto, most of us knew of Gertrude but little of the other siblings.